Blueberries are one of the easiest fruit to prepare and serve. There’s no peeling, pitting, coring or cutting. 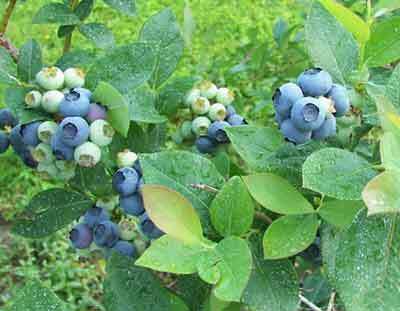 Picking tips: Select plump, full blueberries with a light gray-blue color. A berry with any hint of red isn't fully ripened, and once picked, blueberries won't ripen any further. Since blueberries hang on the bushes in bunches a bit like grapes do, the easiest and fastest way to pick them is to hold your bucket under them in one hand and with your other hand, cup a ripe bunch and gently rub them with your fingers. The ripe berries will drop into your bucket, while the unripe ones will remain attached to the bush. Once picked, don't place the berries, still warm from the sun, in a closed bag or container. Leave the container open so moisture doesn't form in the container. Don't wash berries until just before using to prevent berries from becoming mushy. Chill berries soon after picking to increase shelf life. If refrigerated, fresh-picked blueberries will keep 10 to 14 days. Freeze berries in freezer containers without washing to keep the skins from toughening. Place berries one layer deep. Freeze, then pour the frozen berries into freezer containers. Because unwashed blueberries freeze individually, they can be easily poured from containers in desired amounts. Remember both frozen and fresh berries should be rinsed and drained just before serving. Just before using, wash the berries in cold water. Nutrition and miscellaneous facts: 1 cup (143 grams) of blueberries is 84 calories. Blueberries contain no cholesterol or fat and are also low in calories. Blueberries are high in dietary fiber, Vitamin A and niacin. They contain iron and other trace minerals and are a fair source of Vitamin C.
Blueberries are ranked No. 1 in antioxidant activity compared with 40 other commercially available fruits and vegetables. That means a serving of blueberries has more of the antioxidant power you need to fight aging, cancer and heart disease. Characteristics of Stella de Oro Daylily: Stella de Oro daylily is valued as a compact plant and early bloomer, reaching a height of just 12" with a similar spread. It blooms from May-July. In fact, its ability to re-bloom over a long period, along with its adaptability to a wide range of planting zones and conditions, makes Stella de Oro daylily perhaps the most popular of the daylilies. The fragrant flowers are golden and trumpet-shaped. The foliage is also attractive, forming a dense clump that can function as a groundcover. Sun and Soil Requirements for Stella de Oro Daylily: Stella de Oro daylily will bloom most profusely if grown in full sun, however it will tolerate light shade, thus giving landscapers flexibility. It is also drought-tolerant. Grow Stella de Oro daylily in a well-drained soil. Although not fussy, it will perform better in a soil with plenty of humus. Uses for Stella de Oro Daylily: Stella de Oro daylilies are often planted in lines to form borders but also look good massed together in a planting bed. Still others use them in container gardening. Their tolerance for shade and dry conditions make them a popular choice for areas of the landscape plagued by those two conditions. 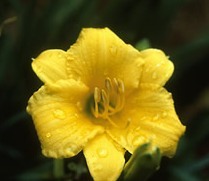 As a deer-resistant perennial, Stella de Oro daylily is also a potential solution for another plague: deer damage. As if all that weren't enough, Stella de Oro daylily makes for a good cut flower. 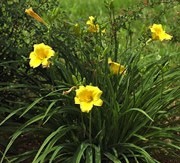 Care for Stella de Oro Daylily: Its individual blooms last just 1 day, but Stella de Oro daylily will re-bloom. It will do so more profusely if the spent flowers are deadheaded: remove stem and all. Also remove any brown foliage in late fall. But Stella de Oro daylily is a reasonably low-maintenance perennial, as it does not have to be divided for several years. When the plants seem crowded and to be waning in vigor, perform division of Stella de Oro daylilies by simply splitting them apart-- in fall or early spring.